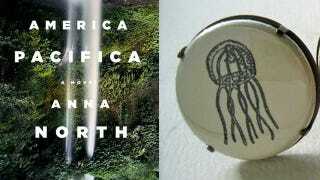 Win A Copy Of Anna North's America Pacifica, Plus Jellyfish Rings! Jezebel writer Anna North's debut novel America Pacifica comes out May 18, but you can win a free advance copy ahead of time, plus one of these awesome jellyfish rings. In the not too distant future, eighteen-year-old Darcy lives on the island of America Pacifica – one of the last places on earth that is still habitable after the second ice age. While a few rich families indulge their nostalgia with hamburgers and baseball, most Pacificans –- Darcy included –- crowd together in cramped tenements and subsist on jellyfish and seaweed. Darcy craves more space and a dinner of real meat once in a while, but she doesn't question Pacifica's basic system –- until her mother doesn't come home one night. Then Darcy is forced on a quest through the dark underbelly of the island, a journey that will take her through Pacifica's corrupt history and make her an indispensible part of its future. In the spirit of Neal Stephenson's The Diamond Age, Cormac McCarthy's The Road, and Kazuo Ishiguro's Never Let Me Go, America Pacifica imagines a world drastically different from the one we know today, and how we might continue to live in it. Want to read more, and also wear a snazzy jellyfish (or squid) ring on your finger? Send an email to tips@jezebel.com with the subject line "America Pacifica giveaway," and tell us your mailing address and your favorite female fictional character. The first 15 people to respond will get an advance copy and a ring for their reading and wearing pleasure. Update: Thanks to everyone for your responses! Giveaway is now closed, and winners will be notified shortly.